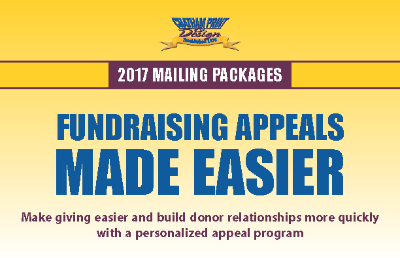 Make giving easier and build donor relationships more quickly with a personalized appeal program. Does your organization reach out to its donor base on a regular basis? Do you need help streamlining the process so your staff and volunteers can spend time on other tasks? Do you want to try out a new look or message, and need help? Chatham Print & Design works with you to help raise awareness and get your annual fund mailings, seasonal appeal mailings, and membership campaigns in front of your donors faster. We offer this booklet to show you mailing packages to make the process easier for you. Towards the back of the book is an FAQ section that addresses some common questions that we are asked in regards to mailings. If you have other questions, please ask! While we developed packages to include in the booklet, we can also create a custom mailing to suit your needs. These packages may just be a starting point to the mailing that works best for your organization. We are happy to share this information with you. Simply fill out the form to access the downloadable PDF. You can also call 973-635-1880 or email Chatham Print Appeals, and we will send you a printed version of the booklet. If you have questions right away, we can talk about those too! Does your organization currently send mailings? Yes, we send mailings now. No, but we want to learn about it.